Many men and women struggling with areas of fat on the body often work extremely hard to target these areas and improve their body contours. This typically includes extensive monitoring of calorie intake and additional exercising. However, there are times when fat deposits on certain areas of the body are not effectively removed with diet and exercise. This is when patients turn to Dr. Peter Vitulli to learn about liposuction alternatives that can be used to contour the body and enhance one’s natural appearance. Dr. Peter Vitulli and the team of A Center for Dermatology, Cosmetic and Laser Surgery welcomes men and women around the area of Jupiter, Florida to take the time to learn about a less invasive way to improve the body known as Slim Lipo. Slim Lipo is a special type of liposuction that works with the use of laser technology. This particular method can assist patients in achieving a better appearance without dealing with extensive downtime, bruising, and the risks associated with more conventional treatment options. Slim Lipo can be done on virtually any part of the body, including the more popular areas for body sculpting including the upper arms, chest, love handles, chin, neck, buttocks, back, thighs, and abdomen. Many patients are able to achieve a smaller pant size in just one appointment. The team of A Center for Dermatology, Cosmetic and Laser Surgery are excited to introduce patients to the many advanced technologies used in their practice to enhance the skin and body. 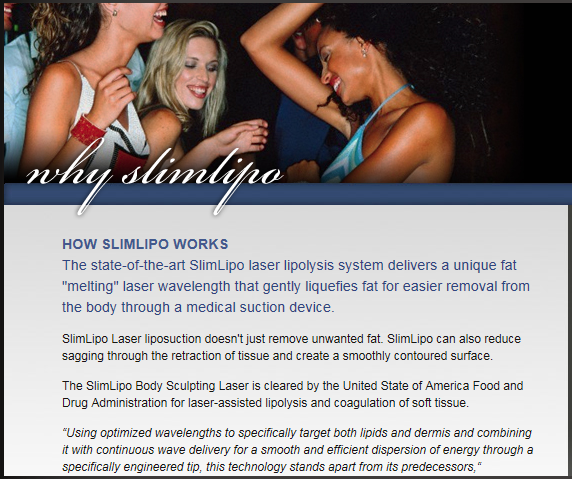 Slim Lipo is just one of many laser therapies available at the facility. Dr. Peter Vitulli is proud to invest his money in procedures that can assist patients in building self-confidence and self-esteem that can carry into both their business and personal lives. Interested in learning more about procedures such as Slim Lipo? If so, contact Dr. Peter Vitulli, dermatologist in the Jupiter, Florida community. He can perform an initial examination and determine if patients are appropriate candidates during a consultation visit in his practice. He assists men and women in looking better and feeling more confident in their own skin!